Oprah Winfrey stopped by CBS'The Early Show' for a candid interview sbout her struggles launching her own network. Oprah even went so far as to admit that had she known launching the network was going to be so difficult she would "have done something else." Being the fan of Lady 'O' that I am, I never bet against her. 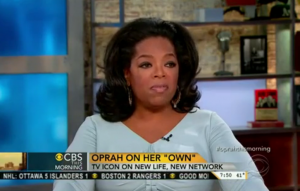 You don't get to Oprah status without having gone through some bumps and bruises. She's built to last and I'm positive she'll make this thing work in her favor. I think that once she gets more original content on OWN they will see big improvement. Right now they're playing a lot of stuff that's already on the Discovery & Discovery Health Channels. She'll come out on top though!